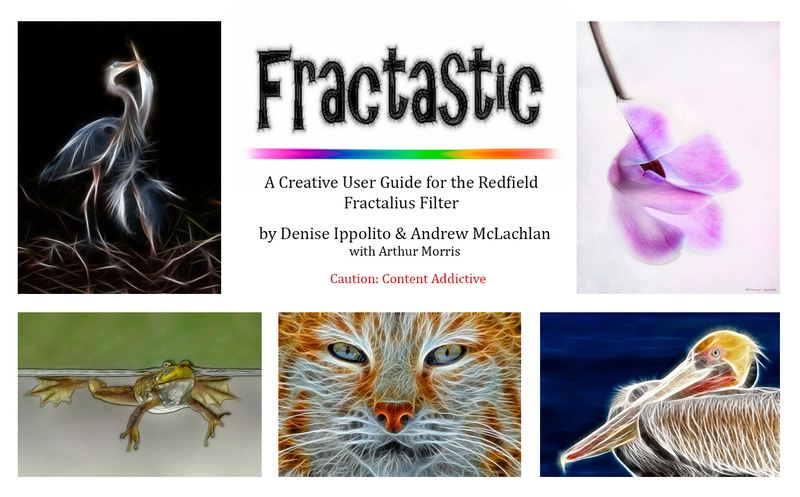 I am pleased to announce the release of Fractastic – A Creative User Guide for the Redfield Fractalius Filter. It was an honor to be invited by the very talented and highly creative Denise Ippolito to co-write this eGuide. Denise was very instrumental in developing my creative, artistic rendering side. Fractalius is a Windows only Photoshop plug-in (Mac users will need to run Bootcamp, Parallels or VM Ware to use (please click here to learn more). 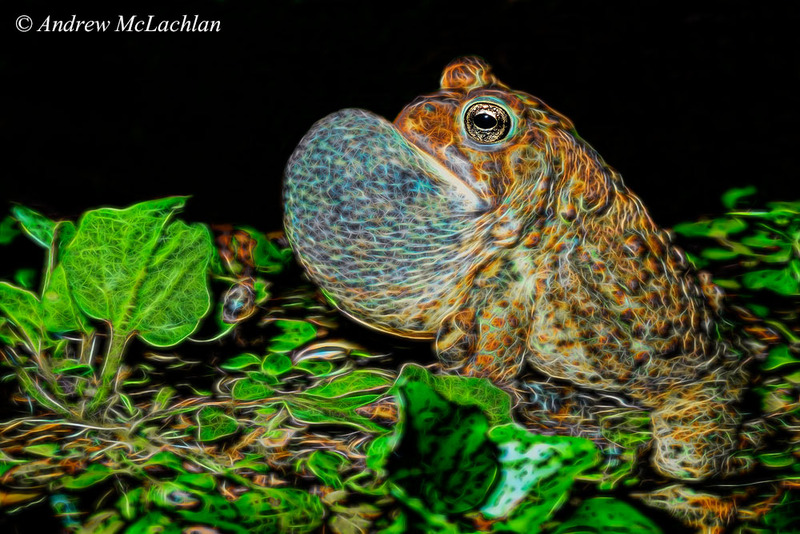 I have often described Fractalius as addictive and a ton of fun to use. The Redfield Fractalius Filter creates eccentric works of art as it extracts the so-called hidden fractals found within photographs. It is important to note that this filter will react differently from image-to-image based on the hidden fractals present within those images. A very special thank-you and acknowledgement to both Arthur Morris and Cheryl Slechta for their skillfull editing and proofreading. And also for their image contributions to the Gallery section of this creative user guide. Denise Ippolito gave Fractalius a huge boost in popularity about three years ago as moderator of the Out-of-the-Box Forum at BirdPhotographers.net. One of those whom she introduced to Fractalius was Andrew McLachlan who since wrote the popular “Ontario Landscapes – A Photographers Guide” for BAA Books. 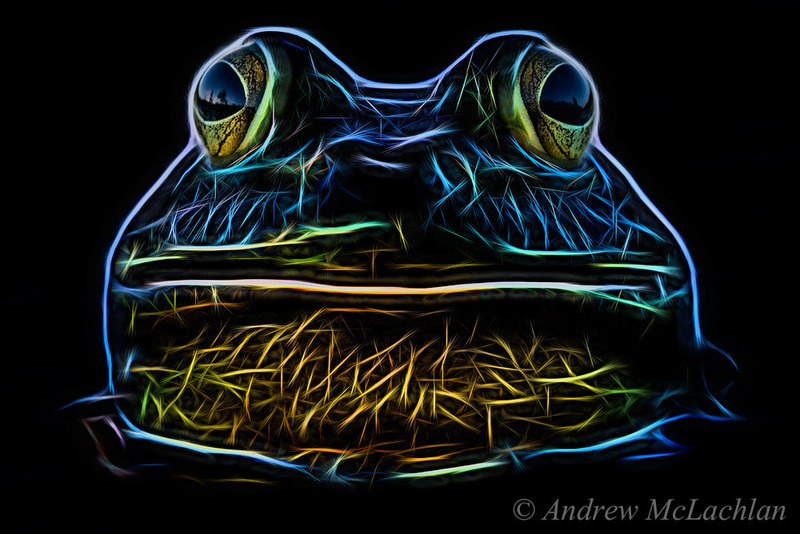 Denise came up with the idea of teaming up with Andrew to write and illustrate a Fract eGuide more than a year ago. The spectacular result: Fractastic. You can purchase your copy of Fractastic for $27 here or via email to: birdsasart@verizon.net being sure to note that you are paying for “Fractastic” or by calling Jim at Birds As Art at 863-692-0906 during regular business hours. A download link to Your eGuide will be sent via YouSendIt. Weekend and holiday orders will be fulfilled the next working day. 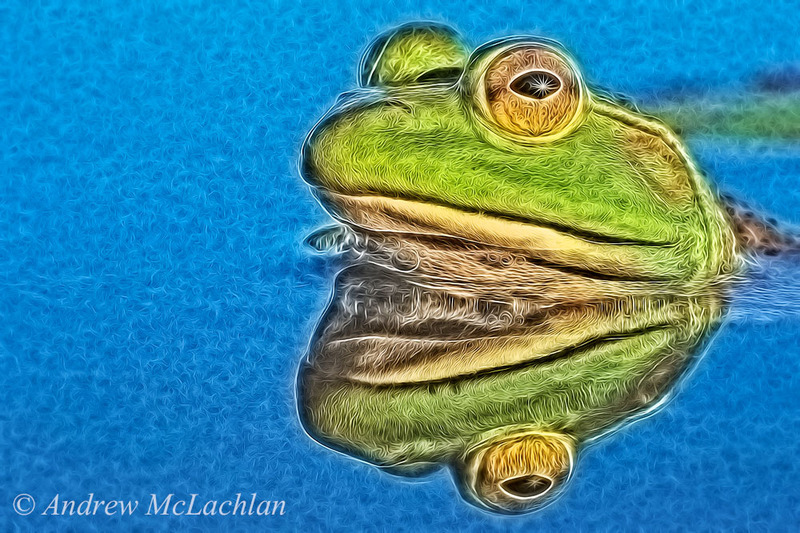 Whenever I am out photographing Bullfrogs I can’t resist creating some frogscape images when I come across a cooperative fellow. 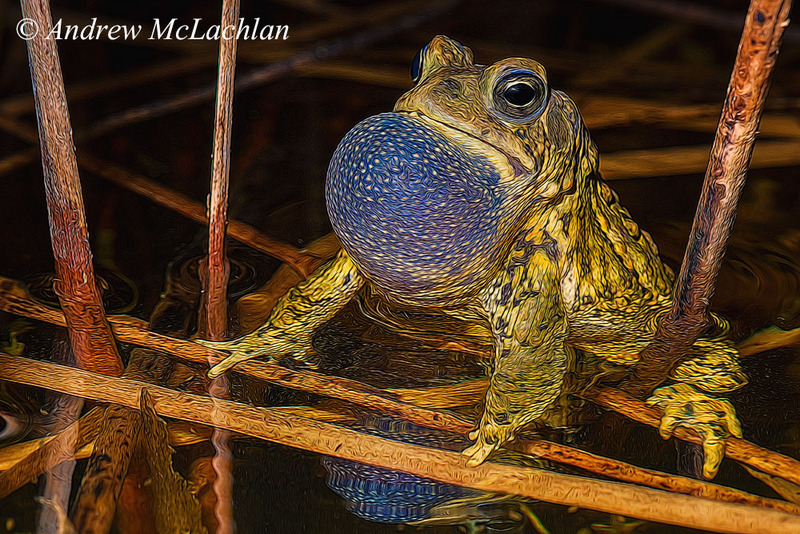 This male bullfrog was more than cooperative for me as he chose to hang-out under this raised lily pad leaf for three days in a row, before moving on elsewhere in the wetland. I guess it was a cool place to hang out. Photographing images like this have become easier than ever with Live View technology. 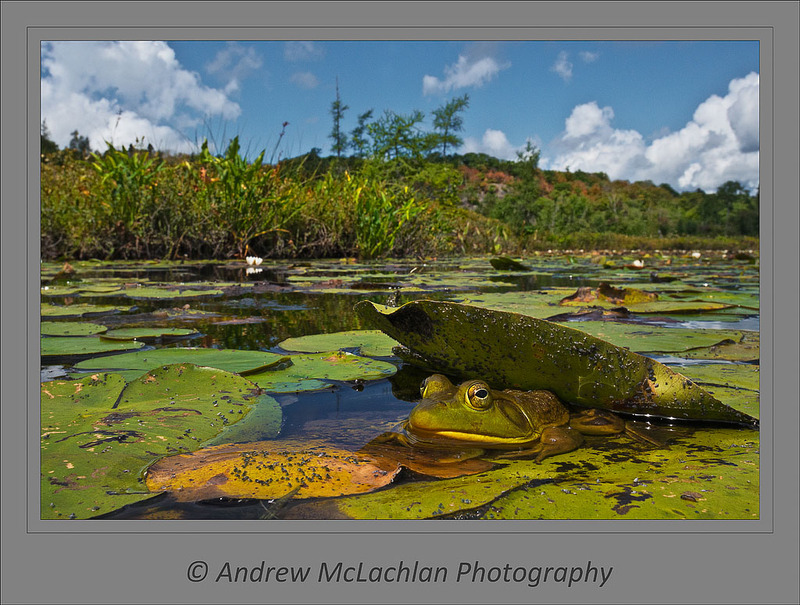 To create the above image I simply brought the canoe up alongside of the frog, used my wide angle lens set to approximately 35mm, composed the photo, and auto-focused on the eye. I also used a 2-stop neutral density filter to hold back the sky. This is often a necessity for frogscapes as the foreground is usually much darker than the sky. 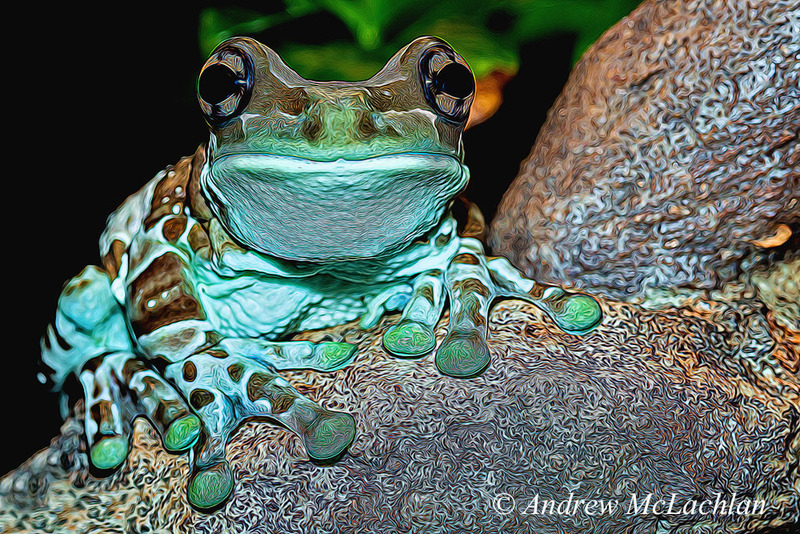 To keep the frog square with the world I always refer to the double bubble level that is in the cameras hot-shoe. If you haven’t checked out the latest issue of the Creative Photography eMini Magazine yet be sure to click on the link in the sidebar to see the latest issue. And while there do note the first photography contest for the magazine has been announce – The MiniMag Sunflower Photo Contest. All the details you need to know to enter the contest are on the front page of the MiniMagazine and to view some of the great images entered already check out the Facebook Photo Album here. If your image is chosen as the winning image your photo will be featured in the Creative Photography eMiniMagazine and Arthur Morris’ Birds As Art Blog. You will also receive a copy of Denise Ippolito’s must-have eBook ‘Bloomin’ Ideas’ and a free ticket to a 2 day nature photography seminar with Denise and Arthur on Staten Island, New York.